It’s been some considerable time since I put in any serious contest entry and I’ve been looking for the chance to do it for a few weeks. I sorted out my data problems a while ago and have been happily able to operate RTTY, PSK, etc ever since. I’ve been looking for a data contest with a section for a 15m only entry. I’ve said before that 15m (21MHz) is my favourite band and I like the fact that I can work a contest until the band closes in the evening and then pick it up the following morning. This weekend was the SCC RTTY Championship which is a contest that I’ve never entered although I did give away a few points back in 2011. Bearing in mind the solar conditions recently, I expected it to be slow but I didn’t expect things to be as slow as they were. Conditions were absolutely dreadful with just 73 QSOs made on Saturday. I had the reverse beacon open to see where I was being received and there were very few spots being reported. I also had the WSPR map available so I would see when any WSPR signals started crossing the Atlantic and I’d know roughly when to start beaming that way. There were no WSPR spots whatsoever between the UK and the USA on 15m and although I did try pointing the aerial that way for a while, there were no RBN spots of my callsign either. I worked EA8PT in the Canary Islands, left my beam pointing that way for a while and was lucky enough to make a QSO with CV7S in Uruguay but that’s the only DX QSO worth reporting. Sunday morning was livelier but still nothing to write home about with no unusual QSOs, just lots of European stations calling. I operate pretty much exclusively by calling CQ during data contests and settled into a nice routine where the rate was slow, so I could do other stuff as well. In the end I finished with 190 QSOs in the log of which six were duplicates. One station called me four times but I always work duplicates in case they’ve made a logging error and got my callsign wrong – By working dupes, I can at least hope that they’ve got my call correct on one of the instances. This contest uses “four-digit number of the year of operator’s first ever official amateur radio licence” as the exchange and the multiplier and I received them from as early as 1947 (a club station) up to 2017. Out of a range of a possible 70 multipliers, I received 57 different years back. I think that’s quite a decent result. 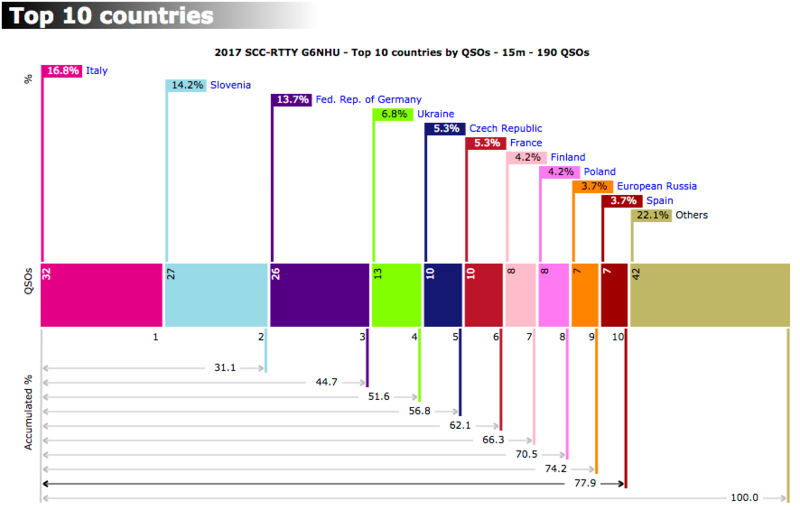 As this contest is run by the Slovenia Contest Club, it’s not surprising to see that Slovenia is right near the top of the list of countries I worked (click the chart for a less blurred version). You can see other interesting graphs, charts and a full and very detailed log analysis by clicking here. On the whole, this was an enjoyable contest and a good chance for me to get my hand back in. It was slow, very slow and conditions were (to be blunt) bloody awful. It was fun to operate it though and good to see that my station still works, even considering how bad things were, RF wise. This entry was posted in Amateur radio, Contesting, Data, HF, RTTY and tagged rtty, RTTY contesting, SCC RTTY Championship. Bookmark the permalink.